From getting branding exposure to making ribbons fashionable and promoting products and services, giving back to the community is hugely beneficial for any business. But, it isn’t about what you get in return for your efforts. It’s about who you are helping. And, here at Coller Industries, we understand that helping out in our community is fashionable. The best thing we get back when we give is the knowledge that we have helped someone. Investing in the community by donating our products is one of our best forms of marketing. But again, it isn’t just about the marketing possibilities; it’s about the people. So, no matter the need, every donation we make comes with the knowledge that what we do is important for everyone. The mission of SBTX is to improve the lives of those affected by Spina Bifida and to promote its prevention through folic acid awareness. Our aim is to increase the quality of life of those with disabilities through our programs and resources. Our goal is to decrease the incidence of Spina Bifida through folic acid awareness. 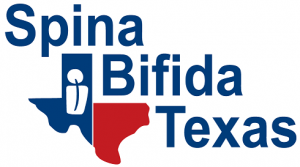 At Spina Bifida Texas (SBTX) we value community, education, and family. Whether horizontal or vertical, these fashionable custom badge ribbons are perfect for any event. They make beautiful awards and also aid in recognizing and identifying sponsors, attendees and so much more. Use these vertical text and graphic ribbons and customize them to fit all of your event needs. Add nearly any text you need and even custom logos and graphics. Choose from a variety of fonts and ribbon and imprint colors to match your event’s theme or to add a pop of color to add to name badges and badge holders. Elizabeth Rivera, Project Coordinator for the SBTX FashionABLE event, provided this excellent description of the organization and event. FashionABLE (as in “I am able”) is a one-of-a-kind program that started 12 years ago. SBTX partners high school design students with children who have disabilities. The high school students are tasked with creating a garment specific to the child’s needs. Children with physical disabilities and their families face challenges in many areas, and this is frequently true where clothing is involved. These children often have self-esteem issues, especially with their physical appearance as it may not be what society considers the ‘norm.’ Their bodies may not be proportional and finding clothing that fits is difficult. Mobility issues require that many children use orthotics or prosthetics to assist them in their daily activities. These devices are often bulky, which also poses a problem when trying to find clothing. Many of these children have issues with fine motor skills and buttons and zippers sometimes become an obstacle when they try to dress independently. Some of the children are totally dependent on their caregivers for all their needs and finding clothing that is easily slipped on and off is sometimes difficult. Our program was developed to address these issues in an innovative way. Understanding our community needs teaches that no matter the setting, there are things to constantly focus on to keep it healthy. In order to help people feel that they belong somewhere, we support and manage these insights. And this comes with accepting each other and the diversity of those around you. This community understanding makes us responsible for those around us. This community responsibility not only aids those in need, but assists everyone influenced by any actions in that community. And, we think that is just like this organization: fashionable! Donations are one way that makes us more responsible in our community. And, building trust in our community is not only a requirement but also the best way to maintain any community. This unified trust is why we, as a company, are always looking to help out in our neighborhood and surrounding areas. By paying attention to small details, such as ribbon roll use, you can improve your event success. Organizing an event can be stressful, but concise planning and paying attention to even the slightest of details will help make any event successful. 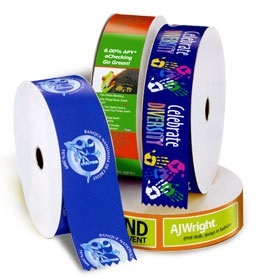 And, using personalized ribbon rolls is a surefire way to get your event planning rolling. From full-color ribbons to softer organza ribbons, we definitely have the right ribbon to improve your event. Customizing the right ribbon to suit your specific event is essential and can make all the difference in achieving your planning goals. Ideally, a ribbon will improve your event because of the imprinting choices. This customization, while seemingly simple, must involve reflection and planning. For example, if you are holding an award banquet to honor a distinguished guest in your area, you want to make sure that your ribbon rolls reflect the appropriate message. Also, make sure to use a uniform ribbon color that either falls in line with your company or matches a theme so as not to isolate individuals. From dates and themes to donor’s names and other personalized aspects, these ribbon rolls will only improve your event when used appropriately. The imprinting on these ribbons should be a theme, motto or other useful text that will go with the event’s purpose. And, again, make sure the color matches the message. Ribbon color is a huge part of your event planning. Make sure your ribbons complement your other decorations and overall theme. Using bright orange and yellow ribbons at an event featuring safety awareness is extremely effective. However, the same colors may not be appropriate at a black and white gala. And remember that it isn’t just about the ribbon colors. Make sure that your imprinting color choice will show up, especially from a distance. Make sure that everything on your ribbon roll choice will be legible. And, get the correct ribbon size so that your message will be seen and not lost in the ribbon decoration. Carefully consider what you want to have showing on each ribbon display. And, most importantly, remember that a bow will not show the same information as a chair or wall embellishment ribbon. From table centerpieces to picture perfect selfie props, colorful imprinted ribbons are the ideal accessory. Even wrap them around cutlery for summer picnics or a more formal corporate dinner. And, they are perfect for tying up a small bag of goodies for each person to take home. At that point, your event has even more power because the friends and family of each attendee will be able to see your message on these ribbons. From colors to materials, not every ribbon is right for every event. But, personalized ribbons are here to improve your event. When chosen correctly, these custom ribbon rolls are sure to make your event one to remember. And, no matter what you decide to use for your decorating, make sure that your imprinting choices match your ribbon choice. Printing on satin versus grosgrain and even organza will always show up differently. Remember to watch your text and image choices when selecting your ribbons. Using the right ribbon makes all the difference for your business meetings and fundraisers. Regardless of the event planned, badge ribbons are the perfect accessory. From simple decorations and place settings to helping organize event staff, these identification tools are there to help every business. Use colorful badge ribbons to label the buffet or use them to coordinate different aspects of your next company meeting. Or choose a color that best suits your elected charity for fundraising efforts. Badge ribbons are flat pieces of ribbon that can be either attached to a name badge or used as other promotional materials. 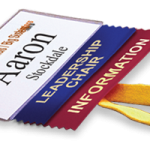 Order badge ribbons as custom or stock titles as both have their benefits. They come with imprinted text that identify speakers, staff and an assortment of other people during your meetings and fundraisers. These ribbons continually prove to be valuable networking and marketing tools and are great for brand recognition. Now that we have that straightened out (pun intended), let’s cover why your business needs badge ribbons. These ribbons help identify roles and rewards or break the ice when attached to a name badge. 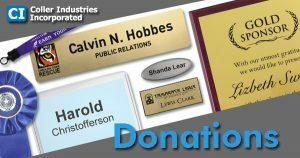 They are perfect for meetings, fundraisers and every other event where name tags are present. So, why do people wear badge ribbons? The most popular reason people wear ribbons is to identify specific titles or traits they might possess. They are also worn to market someone for their job responsibilities. Or, wear a badge ribbon with a silly message or word for a convention. With custom ribbons, text can be created to send any message the wearer wants. From small company meetings to large public fundraisers, badge ribbons do more work than you know. And they don’t just have to be a name badge accessory. These ribbons are worth so much more than just a quick identifying tool. Use them for everything from seating arrangements to silly alternatives to a name tag to fun decorations at any event. Use badge ribbons at any event. Conventions, meetings and conferences are a few of the places where you can find badge ribbons. But have you ever thought of using them for fundraisers, fancy parties and other such events? Their uses are truly endless! Support your cause and give out recognition for your fundraiser. Show support for your cause or charity with specific colors, like pink for a cancer event. Or, use these tools as placement awards for any games or contests going on during your event. Each winner will want to wear their award with pride while they enjoy your event and all that it has to offer. Raffles can be one of the highlights at any big event. Add a fun twist by having people write their names on blank badge ribbons instead of using paper raffle tickets. Even use these blank ribbons to label the prizes for your raffle. But, enough with the identification! 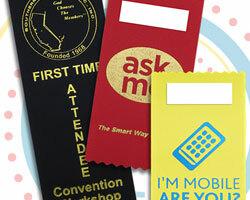 Try these other fun uses for badge ribbons for your business. 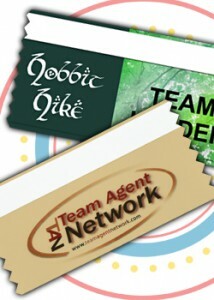 With custom badge ribbons that are easy to order, the titles and text are nearly limitless. Choose a color that best suits your need, and add text and logos or graphics that will make your business ribbons stand out at your next fundraiser. Or, get full-color ribbons with images representing a charity for which you are raising money or goods. From company meetings to summer work parties, another great use for these badge ribbons is party games. Use the different colors for different games or organization during your business festivities. Design your own game using badge ribbons and either focus on the colors or use the imprinted titles or text for party favors and game pieces. So, you have the perfect logo and the ideal personalization, but do you know what badge ribbon type you need to buy? While we do have an idea gallery available for several ideas, sometimes you just need to know which type of ribbon is best for what kind of project you have. With so many options available (stock and custom titles, full-color, graphic ribbons), we guarantee to have something that will fit your budget and needs. And, each of these badge ribbons is easy to use with an adhesive strip on the front of each ribbon. 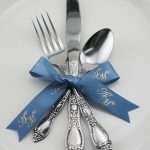 Simply attach a ribbon to a name badge or place them with your table settings at your next fundraiser event. But, no matter which badge ribbon you choose, remember that your business with stand out from your competition with continued use of these fun and fantastic ribbons! These wonderful rosette ribbons aren’t just for awards! 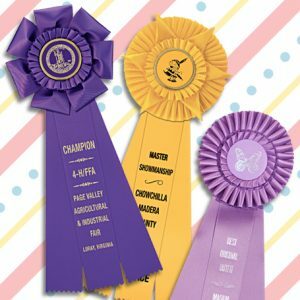 With all of the available custom options for rosette ribbons, these decorative awards are far more useful than most people give them credit. Yes, they are commonly used as award ribbons, but there are so many other uses! Here are some great suggestions for these perfectly versatile ribbons. 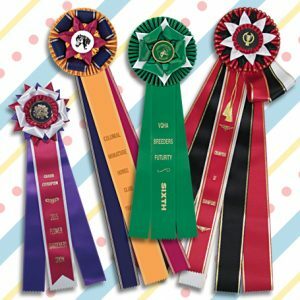 But first, what are rosette ribbons? There are three parts to these ribbons. First, the rosette. The rosette is the fanciest part of these ribbons. Customize each layer (tier) with different colors. Each rosette comes with one to four tiers of ribbons, depending on your rosette choice, tucked and pleated to embellish their look. This stacking of ribbons is what makes rosettes stand out from any other award ribbon. And, it gives them their character and name. The way the tiers are stacked makes these ribbons look like a rose! The second part is the center button. Each button comes as cello, gold-rimmed or satin. And each one can be customized to fit any need you have. Add a logo or a stock graphic to make your ribbon stand out. The button can also have a custom color to match the rosette. This part also holds the rosette together to give it the final custom touch. And lastly, the streamers. While the rosette is what makes these ribbons fancy, the streamers may be the most crucial part. Personalize any of these rosettes with text, logos and other details. There are options of one, two or three streamers with one color imprinting. The colors are also chosen to match the rosette and button. And, this is where you add any custom text to explain the award or other use for your rosette ribbons. Add names, titles and achievements to the streamers to meet any of your needs. 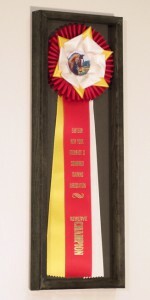 From equestrian events to fairs and classrooms, Rosette Ribbons are perfect for all awards. Rosette Ribbons are great for place ribbons. So, when you have a classroom contest or a need to represent several athletes for the quality of their work, choose from a variety of styles and colors. 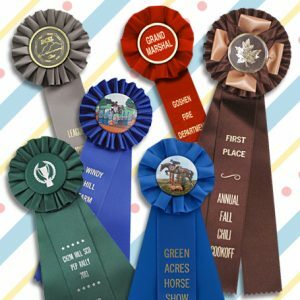 Most ribbons represent up to nine places and also participation awards. All our rosette ribbons are high quality and can be ordered as custom or stock rosette award ribbons. And, these rosettes are perfect for awards for any shows or event types. From sports, hobbies and animals to horticulture, business achievements and education everyone will want a rosette as their award for a job well done. With the fancy tops and long streamers, the high-end look will indeed show recognition for doing well. Customize each ribbon to your needs by choosing a logo or graphic to go with the sporting event or school activity. Then, provide a message for each streamer and individual names for each award. No matter your choice, each award recipient is sure to treasure such a unique gift. Rosette Ribbons are not only for awards! Use them at your next party or other event. 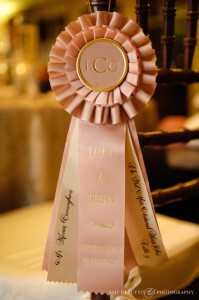 And while awards are perfect on a rosette ribbon, customize this ribbon choice to meet any need. From table decorations to fun props for a photo booth at a wedding, rosettes are more versatile than you know. Don’t limit your thinking when it comes to using ribbons during any event. The key here is to make sure you display the correct message. And make sure that your color choice matches any theme you might have. Using each part of the rosette, customize these fancy ribbons to match your event. From a wedding to a business convention, rosette ribbons can be the answer to almost any decorating need. Use them as a fancy place setting or a way of directing people into the right banquet room in a hotel or other venue. Use your custom rosette ribbons to celebrate someone meaningful. Whether it’s for your business or a family member, a thoughtful custom gift is sure to make someone feel special. From birthdays to Valentine’s day and Christmas to Halloween, every holiday needs a little ribbon. Instead of traditional wrapping, use a rosette to replace the average bow on a present or party favor. Or use these fancy ribbons as the actual gift. Recognize anyone for a job they have done well. Or for just turning a year older. And, no matter the reason for the gift, your recipient is sure to remember the thoughtfulness that went into the customization of this unique ribbon. So, remember the next time you use rosette ribbons that they are so much more than meets the eye. And, if you need help choosing the right rosette, try this! From lampshades to planters, workplace decor looks better with ribbon. Now that the holidays are over, it’s time to put all those extra gift-wrapping ribbons to good use. Accessorize your workplace by adding ribbons to interior decorations and office supplies. Decorating your office is tons of fun and a great way to bring more excitement to your work space. Employees and visitors will love seeing these strips of color throughout your office. And, giving them something beautiful to look at builds a positive company image. Here are seven easy ways to decorate your workplace using leftover ribbons. Use ribbon strips to create a unique wreath for your office door. Choose colors that match your logo or go well with your work space. Easy and quick to make, this circle of color will bring a smile to colleagues and guests as they enter your office. All it takes is a circular object and any extra ribbons you have. Even a casual work environment can use a ribbon chandelier. And the best part is you can make it however you want. Whether you just let your ribbons hang down in a straight line or do something fancier, a chandelier will add character to your work space. An easy, quick way to use extra ribbons is tying them around any flower vases you have in your office. Large potted plants also look amazing with ribbon accessories. Once you wrap a ribbon around the planter, consider also putting bows on the plant itself. Make sure your ribbon colors match the plants to create the perfect look for your conference room or office. With custom ribbons and a little imagination, turn ordinary pens into something extraordinary. Wrap ribbon around each pen then add glitter or rhinestones to give them extra flair. Give a decorative pen to each employee and save a few for the front desk. Visitors will appreciate your creativity and may even hope they take your front desk pens by accident. Long and flowing ribbons are perfect to make garlands to decorate a hallway or room. And don’t just use ribbons. 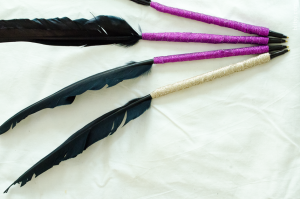 Get creative with decorative pieces like beads, feathers and seashells. This is your chance to add your personal touch to your workplace. Trim your floor and table lamps with leftover ribbons. 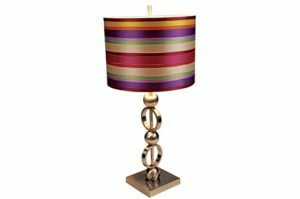 Glue pieces of ribbon to a lampshade in a horizontal or vertical stripe pattern. Once you’re done, put the lampshade back on to enjoy your new work of art. Sew ribbon strips together to decorate your break room or foyer with trendy pillow cushions. 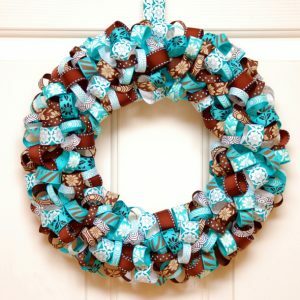 This project allows you to take any combination of ribbons you want and make something unique. And, colleagues and guests will appreciate having something comfortable to lean against while sitting. So, from light fixtures to writing instruments, extra ribbons are a great opportunity to decorate your workplace and use your creativity.